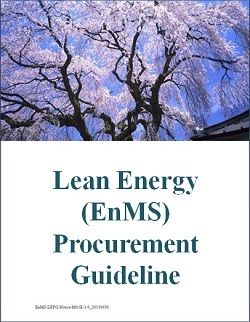 One of the distinctive features of ISO 50001 clearly is the addressing of the "Lean Energy (EnMS) Procurement". Other management systems use the term "purchasing" which is a specific requirement to have a procedure to acquire products or services ensuring the activities complying to the specific management system objectives. Whereas the ISO 50001 "procurement"is an acquisition process with a distinctive objective of pursuing "continual energy performance improvement" hereby when employing the products or services, it ensures they are in line with the beneficiary's EnMS throughout their lifecycle. With the supply chain effect, all energy users should recognise, with an effective procurement strategy, the organisation can develop superior clients and suppliers network to capitalising the multiple effect market coverage. This is what we call the global competitive advantage. When the organisation reaches to the full appreciation of the ISO 50001 class EnMS operation providing various opportunities, it also recognises that series of "continual energy performance improvement" activities are no longer self-contained issues but requiring smart team work with stakeholders to gain optimum solutions. This is where we see the superiority of ISO 50001 that addresses "Lean Energy (EnMS) Procurement". ISO 50001 promotes the global EnMS society and partnership that entities conscious of energy performance to stay healthy while entities not conscious to retire from the competitive scene.